Some directors are very natural in their status as crowned auteur; their films always seemingly a product of their own conception which seems unavoidable to visually mistake. Seeing all of Andrei Tarkovsky’s films, this is perhaps clearer to see than most other directors. His distinctive visual style, which morphs into several similar variations, is instantly recognisable. Dripping with faded lights, distinct textures and elemental forces, his films become a collection of photographed memories with different colours but mostly shot through the same prism of ideas. Tarkovsky’s style therefore invades all of his work within other media too. It is very clear from his writing style that the same elemental forces of interest and same aesthetic approaches are being adhered too; the physical embodiment and malleability of time, the forces of wind, water and fire, the poetry of decaying architecture and what it says about civilisation. Even in his interviews, the words he speaks seem to carry this same collection of principles; they are words that, if applied to a visual form, would look exactly the same as the actual cinematic forms the director created. It seems fitting then with all of this talk of visual nature behind non-visual actions, that Tarkovsky was a prolific photographer. The man has captured his true reality in many pictures, slowing time itself down to a twenty-fourth of a second. Even with this, his auteur visual stance is widely recognisable, so much so that it seems absurd, almost crass to point it out. That is however, what this article is about. So many of Tarkovsky’s pictures capture that same sense of distanced mysticism and nostalgia that a number of the them are fairly easy to link to several of his films. The most obvious of these are his pictures of dogs. There are a number of readings of the presence of the dog in both Stalker (1979) and Nostalghia (1983). However the one that seems most fitting in connection with his Polaroids is the instant linkages made between the characters of the films and Tarkovsky himself. The dog’s presence can seem to symbolise the presence of the director, like a calling card or simply a gentle nod. In the Polaroids this is clearer as the presence of the dog in front of camera implies the presence of Tarkovsky behind the camera. Tarkovsky also has a special skill in capturing photographs of places at certain times of the day meaning that they often resemble The Zone from Stalker. 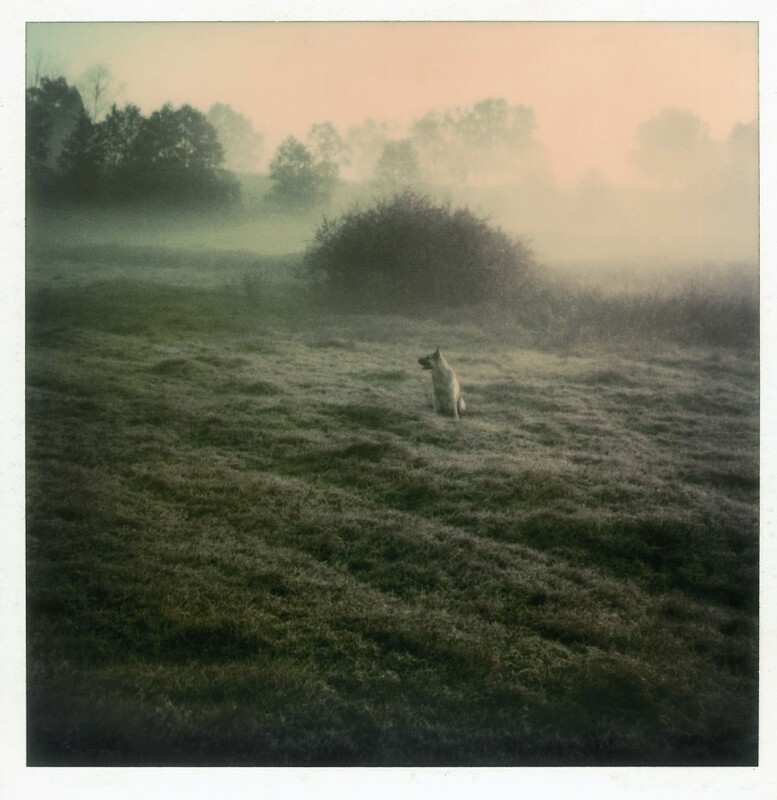 The Polaroid of the dog with the mist quietly falling upon the ground is a very natural expansion of Stalker’s world at least in an obvious visual sense. Stalker in particular seems relevant to many of the landscape Polaroids simply because of the natural light. This light often brings out the greens and the faded turquoise almost to the point where they seem metallic. Once out of the totalitarian, sepia world, The Zone embodies this faded world with the distant ghost of human activity felt through the presence of broken buildings. The implication of the presence people through the showing of their explicit upheaval is something Tarkovsky has continually returned to in his films. The idea forms itself directly into the narrative of Solaris (1972) while being visually hinted at in the likes of Andrei Rublev (1966), The Mirror (1975) and The Sacrifice (1986). 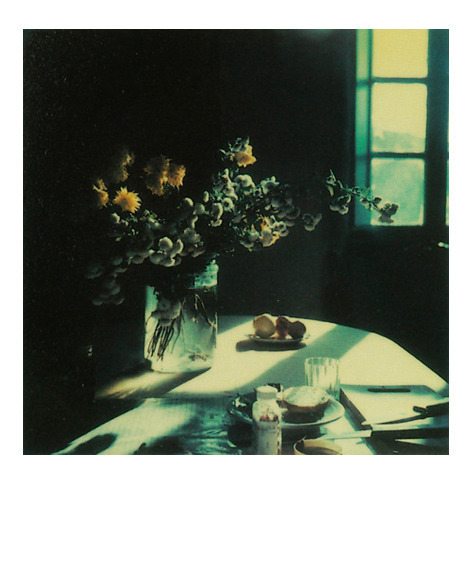 This theme also makes it into Tarkovsky’s Polaroids, several of which show loss through implication. The most famous of these is a beautifully coloured shot of a table. The table has flowers on and is set with a meal and dishes. There is however no one there. The shot has that haunting Tarkovsky quality that hints at something unreal manifesting through the consciousness of a person in exactly the same way that the man recreates his dead wife thanks to the strange powers of planet of Solaris. Light invades even the darkest of spaces, shining patches onto beds and corridors, empty chairs and vases. They seem closed and yet infinite much like the readings of Tarkovsky’s films. The clash between the captured nature of time in the pictures and the “sculpting” of time in his films is surprisingly non-existent. Many of the photos balance naturalism with the heightened beauty of Tarkovsky’s stylised world and therefore act as an extension to his films (especially Nostalgia and The Sacrifice of which were filmed when many of the photos were taken). The other main theme to enter into Tarkovsky’s Polaroids is one that is very natural; that of family of memory. Like the snapshots taken by any family, his photos often hold personal moments in time with various relatives. A number of pictures of women resemble of segments of his film The Mirror. They have a motherly fondness to them even when they’re not actually maternal. These women are often captured in a moment of natural awareness; acting normally but knowingly at the same time. These pictures display fragments of a life, perhaps even a narrative that has never been truly told. This is something extremely Tarkovsky-esque with the director often finding more to say about the things that are not shown plainly or obviously. There is a sense of raw beauty in Tarkovsky’s Polaroids, proving that great ideas can transcend whatever medium they decide to fall into. Like his films, the photos present a number of thematic and aesthetic ideas though these are not sculptures in time; they are mementos and sketches of some of the most beautiful works of cinema ever to be conceived. It is fitting then that these photos are Tarkovsky’s world in a microcosm; questioning, subtle and endlessly cinematic. Pretty sure you meant ‘maternal’. I did indeed. Thank you for alerting. Changes are now made. The Problematic Reception of Sound And Vision in Derek Jarman’s Blue – Part 1 (Introduction).